We study heavy-weighted automata, a generalization of weighted automata in which the weights of the transitions can be any formal power series. We define their semantics in three equivalent ways, and give some examples of how they can provide a more compact representation of certain power series than ordinary weighted automata. Fortin, M, Bonsangue, M.M, & Rutten, J.J.M.M. (2014). 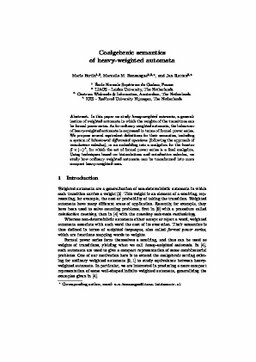 Coalgebraic semantics of heavy-weighted automata. Formal methods [FM]. CWI.